I'm featured in a beautiful treasury right now! 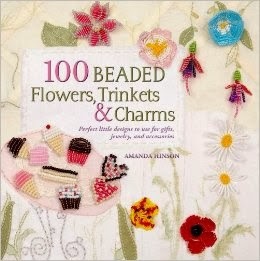 That's my Lavender Scented Handstitched necklace on the bottom row, in the middle! I love those glass lavender bead pendants there to the left of my necklace! 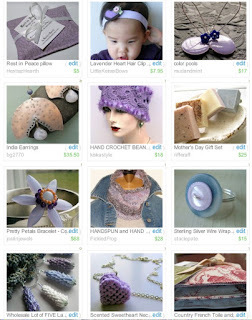 Such a beautiful treasury! This weekend was very nice! The Sweetie and I got to see The Knowing, and Monsters vs. Aliens. Both great movies! We wanted to go to DollyWood, but the weather was just not good DollyWood weather. Maybe this weekend! I've also been getting information together for a Disney World trip for this fall! I know I know!!! We were just there last month... But I'm so ready to go back! lol We would love to find some more people to go with us, but schedules just never work out for everyone! And there are certain times of year that I just refuse to go to Disney World! ;) Crossing our fingers for this fall though! Although, if The Sweetie gets to work on this video game project that he's been talking to the music producer about, we won't be going very far from home for very long for a few months! Other than the trips we have planned for this summer while I'm off, we'll most likely be in Knoxville. The Sweetie will need to be close to home so he can stay in good contact with the producer. I'm so excited for him! I guess we'll just have to see how it goes. I do love this time of year though! Planning for summer vacations and time together makes me feel so happy! And on that note... I'm off to bake some cookies! Have I mentioned lately that I love seed beads?? ?